The goal of this study is to provide high quality datasets with which to benchmark and evaluate the performance of multiview stereo algorithms. Each dataset is registered with a "ground-truth" 3D model acquired via a laser scanning process, to be used as a baseline for measuring accuracy and completeness (the ground truth is not distributed). 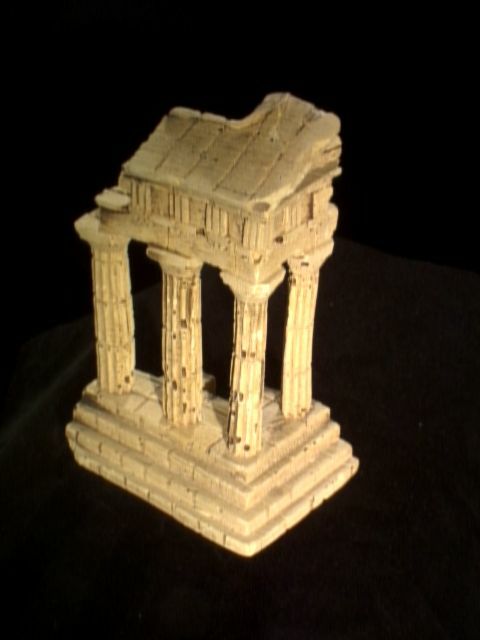 The object is a plaster reproduction of "Temple of the Dioskouroi" in Agrigento, Sicily. Click on thumbnail for a full-sized (640x480) image. 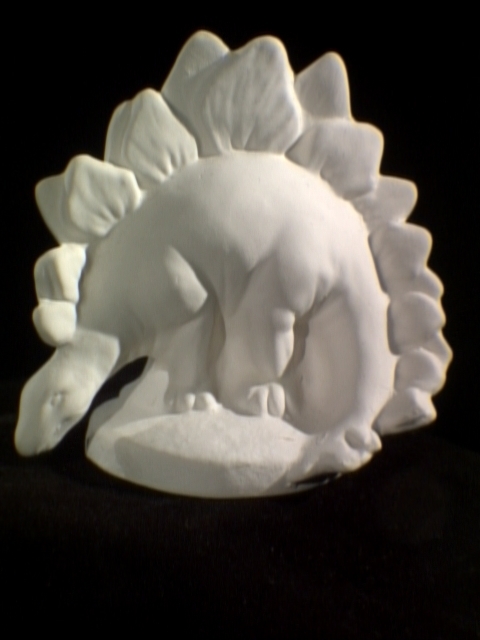 The object is a plaster dinosaur (stegosaurus). Calibration accuracy on these datasets appears to be on the order of a pixel (a pixel spans about 1/4mm on the object). It is difficult to quantify the calibration accuracy because we don't have point correspondences in all views. However, when the images are reprojected onto the laser scanned mesh reconstruction and averaged, 1-2 pixel wide features are clearly visible. Some images and regions of the object are a bit out of focus, due in part to the limited depth of field afforded by the imaging configuration. This is probably a blessing in disguise, as it helps compensate for the lack of sub-pixel registration. While there is certainly room for improvement, we expect that this degree of accuracy will enable good results for most algorithms. Note that the images have been corrected to remove radial distortion. The images were captured using the Stanford Spherical Gantry which enables moving a camera on a sphere to specified latitude/longitude angles. To calibrate the cameras, we took images of a planar grid from 68 viewpoints and used a combination of Jean-Yves Bouguet's matlab toolbox and our own software to find grid points and estimate camera intrinsics and extrinsics. From these parameters, we computed the gantry radius and camera orientation, hence enabling us to map any gantry position (specified as a latitude/longitude pair) to a complete set of camera parameters. We then scanned the object from several orientations using a Cyberware Model 15 laser scanner and merged the results using vrip. The cameras were aligned with the resulting mesh using software written by Daniel Azuma and Daniel Wood plus some additional routines that we wrote. Whew! We sampled up to 395 viewpoints on a full hemisphere. However, in certain configurations, the gantry cast shadows on the object and these images had to be manually removed. We found that 40% of the images contained shadows. To limit the dropouts from shadows, we covered the hemisphere twice, with two different arm configurations, for a total of 790 views. Using this strategy, we were able to get non-shadowed images for a majority of the hemisphere (e.g., 80% of the hemisphere for the "temple" data set). "imgname.png k11 k12 k13 k21 k22 k23 k31 k32 k33 r11 r12 r13 r21 r22 r23 r31 r32 r33 t1 t2 t3"
name_ang.txt: latitude, longitude angles for each image. Not needed to compute scene->image mapping, but may be helpful for visualization. Note that (lat, lon) corresponds to the same image as (-lat, 180 + lon), rotated 180 degrees in the image plane. The positive and negative latitude images correspond to the two coverings of the hemisphere, as described above, to avoid shadows. The -lat images appear "upside-down" (in fact they're rotated 180 degrees). information about the object, including bounding box; in some cases, includes tips useful for computing visual hull, if your algorithm needs it.